Agapito was born on a ranch known as the "Potreros" in Burgos, Tamaulipas, Mexico on November 19, 1924, to Wenceslao Zuniga Zuniga and Lucia de la Garza Gonzalez. This is his legacy. He was the seventh son of a family of 13. His musical inclination came at a very early age; conjuring musical ideas was the ideal past time for this young boy. His father took note of his son's interest in music and bought him a harmonica–a harmonica that he played faithfully. This was a major highlight in Agapito's youth because he could now transfer those ideas and make them a reality. By the age of eight, he started playing the accordion. Practice makes perfect and his diligence was impressive. As a result of his diligence, along with the dedicated assistance of two uncles, Marco and Emilio Zuniga, Agapito quickly learned to play the instrument that would one day make his name known throughout the region–his accordion. His family moved to Rancho Las Lavores in 1932 and subsequently to Rancho La Ventana near Matamoros in 1934 in search of better horizons. Like his father and brothers before him, Agapito (now age 10) dedicated his early years to agriculture. Back in those days, cotton was harvested manually–a very hard and tedious job. However, the youngster combined his work of picking cotton with entertainment at parties and dances. The accordion was a visible symbol at festivities enjoyed by a multitude of folks after a long day’s work in the fields. This accordionist–not yet accomplished–but an accordionist, nonetheless, enlivened the lives of farm workers young and old. Other farm workers who could play the "bajo sexto" or guitar would join in to play for the folks, as well. Indeed, it was a party everyone enjoyed and laughter everyone deserved! For Agapito, the accordion was not only an escape after an arduous work harvesting the fields in the sunny North Plains of Mexico, but it was also extremely gratifying. By 1935, the family relocated to Rancho Cypress where they lived for about a year. Given his family’s financial economic situation, another move ensued in 1936 to Rancho La Roca located near Sandoval, Tamps. Rancho La Roca’s proprietor was Don Dolores Cervantes, father of Catarina Cervantes, who later married Agapito's brother, Julian. At La Roca, Agapito developed an ingenious plan in which to earn additional money for his family. Taking his position with accordion in tow at the Sandoval Railroad Station, he played his accordion and sang while customers waited for the train to arrive. Upon the train’s arrival, he would board the train and continued to entertain the train’s customers. Everyone seemed happy, but not as happy as the little boy with the accordion! Indeed, there was something enchanting about La Roca that caused him to feel a deeper yearning to become a musician. His sense of analyzing, comprehending, and performing musical notes simply by watching and listening to other musicians was keen. He easily deciphered complicated notes and reproduced them absent any formal training. His observations, inquisitive mind, and yearning to be the best accordion player made him what he is today—a true pioneer. Rhythmical sounds emanating from the accordions played by other talented musicians not only enlivened Saturday night dances, but also served to usher a transition that would soon take place in his life--a transition from working the fields to becoming one of the greatest accordion players, both in Mexico and the United States. In the latter part of 1937, with the help of his father and the money he earned from his work, he bought his first accordion. He encountered many obstacles along the way, but his dream to succeed penetrated those obstacles, thus turning challenges into opportunities. By 1939, those dreams became a reality. He formed a duet with guitarist, Irineo Orta González, who was at least 30 years his senior. Despite the age difference, both musicians worked beautifully together. His first payment for a "tocada" (that could last a few hours) was $2.00. This was considered to be a lot of money when compared to the measly $1.50 he earned working the fields for the entire day! In 1940, Agapito formed a trio known as "Trio Los Desveladores" that included himself, Juan Valdéz, and José "Chepe" González; the trio quickly gained success in Matamoros. By 1944, Agapito, along with Guadalupe González, formed the duet known as "Zuniga y González," however, it was short-lived and subsequently dissolved in 1946. Shortly thereafter, Agapito moved to Matamoros, Tamps. where he met Rafael "El Pato" Gonzales, who was another great singer. He and Rafael decided to unite their voices for the first time. Their debut was a preliminary exercise of sorts–testing the waters, so to speak, to see how the public would respond to them. Their public loved them! This was the beginning of an extended and rewarding career for both of them. In his pursuit of excellence and in order to remain popular and in demand, in 1948 Agapito emerged with a renewed vigor as, "Los Desveladores de Agapito Zuniga" attaining success on both sides of the border. The group toured in Corpus Christi, Texas, as well as other cities in the state of Texas, reaping applause from the Texano public. Acceptance of this conjunto was immediate. The public was swept off their feet with their musical talents. It did not take long before the public embraced and claimed them as their favorite artist. Los Desveladores de Agapito Zuniga realized their first recording in Alice, Texas. In 1951, the recording house of Discos Peerless from Mexico City hired Agapito to record his first record. The demand from the public to gain access to more recordings of Los Desveladores de Agapito Zuniga was so great that the owners of Discos Ideal of San Benito, Texas, and the owners of Discos Falcon of McAllen, Texas devoted themselves to producing record after record to fulfill the demand. Without a doubt, the recording studios were cognizant that every record they produced for Agapito would be a sell out! All grown up, these triumphs did not change the man from the young boy he had always been–compassionate, cordial, and amicable to all whom crossed his path. In the midst of his innumerable artistic commitments, he remained focused and devoted to his family and found time to stay close and connected to his friends. The departure of Juan Valdéz from Los Desveladores in 1951 led Agapito to form a trio with Rafael González and Pedro Carrizales, which was known as "Agapito Zuniga y Sus Cancioneros del Bravo," with whom he toured successfully through much of Mexico and South Texas. The trio was loved and applauded by the public. In 1953, Agapito also lent his services to the City of Matamoros in the capacity of a motorcycle police officer. On May 28, 1954, Agapito arrived in Corpus Christi, Texas where he established his residence. Along with his family, he also brought a colossal repertoire of musical talent. An extraordinary man was about to embark in the United States. As fate would have it, Agapito reunited with old friends and former co-workers, Juan Valdéz, and Juan’s brother, José "Chepe" González. Together, along with Rafael González and Ramon Garcia, they brought a renewed spirit to the group Los Desveladores. Los Desveladores prevailed in attaining many successes during their tenure; however, on August 18, 1958, due to personal reasons, Los Desveladores parted ways indefinitely. Two members of Los Desveladores retained the group’s name, while Agapito immediately organized a new musical group and named it "Agapito Zuniga y Su Conjunto." The newly formed group consisting of Agapito, Ramón Garcia, Roberto Torres, Rafael G. González, Juan José Zuniga, and Isidro Govella, traveled and entertained throughout the state of Texas without interruption and much continued success. With an increase in fame, Agapito was considered as one of the greatest exponents of Texano music. Consequently, this led him and his conjunto to tour across the United States, reaping success, accolades, and the applause of fans. He is also remembered for employing two saxophone musicians in his conjunto (as opposed to one saxophone player used by most, if not all, conjuntos) and the use of the accordion piano (key accordion). Suffice it to say, he was the first musician to incorporate the use of two saxophones and the key accordion in this music genre. Agapito Zuniga y Su Conjunto clearly demonstrated a strong ambition and the desire to succeed and bring joy to their fans. Artists experience new efforts, new victories, and many disappointments on a daily basis, all of which serve to strengthen their spirit. It is that conscious exertion that produces high energy and leads an artist to work harder to obtain the applause and the consecration of the public. Agapito was no different. He could have jettisoned his career as a musician when failures appeared, but his zeal, spirit, and will were too intense to stop doing what he enjoyed. Music, singing, and playing the accordion were the lifeline to his heart. Manifestation of his success was clearly evident at the box office–where it counted! He was known by many promoters and the public as a "Magnet at the Box Office." Agapito and his conjunto were regulars at Club Westerner in Victoria, Texas, a popular dance hall where some of the best conjuntos and orchestras performed. After 10 years of performing at the Club Westerner, Agapito was awarded his first trophy for "Top Public Drawer," which was presented by the late Mr. Juan Manuel Villafranca. More accolades followed. Agapito's second trophy was presented by Discos Bego; the third trophy was presented by Arnulfo Delgado of San Francisco, California; and the fourth trophy was presented in Corpus Christi, Texas by Mr. Domingo Pena in celebration of Agapito and Rafael’s silver anniversary for their 25 years of contributions as artists to the music industry. 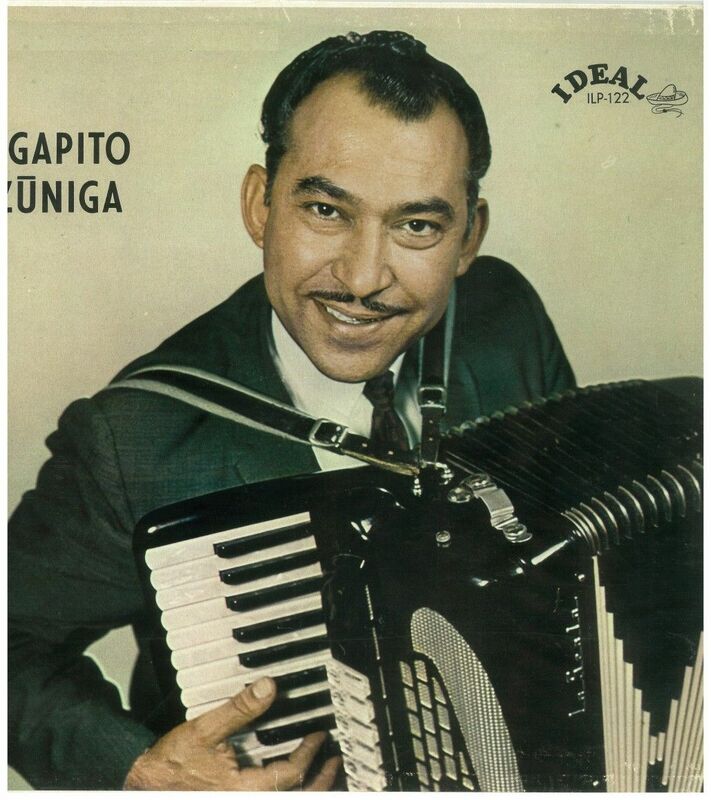 Agapito Zuniga–composer, successful vocalist, accomplished accordionist, recording artist, and popular performer in the conjunto music genre–is a true pioneer. This influential accordionist recorded numerous songs with recording companies Peerless, Ideal, Bego, El Toro, Falcón, Freddie Records, Frontera, and Hacienda. In the late 1960s, Agapito started his own recording company and produced many recordings under his label of Escorpión Records (Discos Escorpión) for his conjunto, as well as other start-up conjuntos who needed to get their foot in the door. After having performed for a number of years in a professional level, coupled with his observations of watching and learning from other talented accordion players, Agapito took note of something quite interesting: Texas musicians performed sitting down while playing their instruments and singing. In contrast, his preference while performing with his band was to be in a standing position. Other musicians quickly took note of this. Shortly thereafter, other groups adopted Agapito’s trademark performance of standing during their performances. Since his arrival in Corpus Christi, he livened up weekly dances held in the surrounding agricultural communities, whose Mexican population increased considerably during cotton harvesting season. He also performed in theaters, alternating performances with top-notched artists like Lydia Mendoza, Chelo Silva, Isidro Lopez, Andrés Huesca, Valerio Longoria, Narciso Martínez, Juan López, and many more. It was around that time period that Agapito became known as "El Esorpión de Texas." Agapito's name was now a household word; he reached new heights, much success, and popularity. Consequently, he and his group were invited to appear live on several occasions on the Domingo Pena Show, a popular show aired weekly on Sundays. With success, came other opportunities. 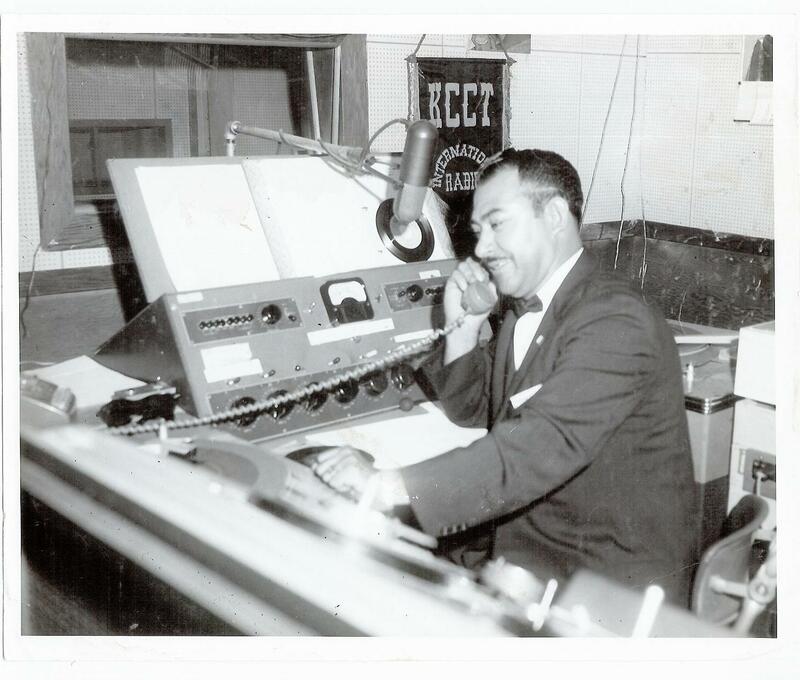 On February 10, 1960, Agapito was offered a contract with Radio Station KCCT, which he delightfully accepted. The program was called "La Hora de Agapito Zuniga". . . better known as "Con Alma Chiquitita" (his trademark). Shortly thereafter, KCCT increased his broadcast to air on a daily basis due to its popularity. The program aired successfully for many years. Inducted into the Texas Conjunto Music Hall of Fame & Museum in San Benito, Texas on November 29, 2008, Agapito was recognized as one of the pioneers of conjunto music. His induction was added to the previous list of outstanding inductees some of which include: Narciso Martinez ("El Huracán del Valle"), Valerio Longoria, "Flaco"Jimenez, "El Ruco" Martinez, and many other legends. His music is now a part of the musical productions of other well-known pioneers of this genre, some of which include songs like "Con Alma Chiquitita" (polka), featured on the albums entitled South Texas Polka Party and 15 Early Tejano Classics; "Vieja Escalera" (his own composition) featured on the album entitled Texas Conjunto Pioneers produced by the nationally prominent label of Arhoolie Records. Anyone who has listened to Agapito’s songs will agree that they carry an essential cultural element that Mexicanos (and possibly some gringos!) can relate to–it’s a culture that will continue to live on as long as Texano conjunto and norteno music exist. A prodigal composer, some of Agapito’s compositions that reached new heights of success include: Vieja Escalera, El Corrido de Oscar Martínez, Mujer Aventurera, El Escorpión, Fronteras de Río Bravo, Esta Noche Me Emborracho, and Por una Traición. In terms of instrumentals, his musical repertoire includes the following: 1) Polkas: Lori Ann, Elisa, Babe Juarez, Lisa Marie, and El Calcetín Parado; 2) Redovas: Llegando a Burgos and Los Farolitos; and 3) Huapango: El Fronterizo. Agapito is also the author of the song that the City of Burgos has adopted as its hymn, "Burgos, Es Mi Tierra," which he wrote not only because of the great affection he has for his hometown, but also because of a promise he made to a childhood friend, Don Vicente Ramos Ramos, who also served as the Municipal President of Burgos. Thus, the presentation of this special musical piece was celebrated at a dance held on June 5, 1974. Along with Agapito and his conjunto, other performing artists included Los Hermanos Camarillo and Matilde y Brígido. All funds raised at this event were donated for the purchase of the land that is now occupied by the Municipal Civic Center. There was a radical change in Agapito’s life on July 1, 1984. After serving his beloved public for over five decades, he transitioned from conjunto music to the gospel circuit. It was a decision of conviction to serve the Lord. Shortly thereafter, he and his wife teamed up as a vocal duet, and incorporated the conjunto-style music a/k/a "música alegre" into their Christian music. Together, these musical artists delivered a profound expression of their dedication to what was (and continues to be) important to them–growing together in their knowledge of God, sowing seeds by spreading the gospel through music and testimony, and bearing fruit through the blessings received by God's mercy and grace. The couple traveled extensively throughout the United States, Guatemala, Bolivia, and Mexico taking the gospel to all who wanted to hear. In 1988, Agapito received a Certificate of Achievement from Berean College for successfully completing the course "A Traves de la Biblia" with The Assemblies of God. Both he and his wife devoted their lives to serving God with sermons, testimonies, and music until their retirement in 2004. Other accolades include awards and trophies from the Christian Hispanic Music Awards in 2000, 2001, and 2005, as well as the David Music Award in 2008. The couple continues to be active members at their home church, The Lord is Peace Worship Center in Corpus Christi, Texas, which is pastored by their son, Dr. Arnold Zuniga. On May 31, 2014, Agapito was honored with a honorary degree in Doctor of Theology with Honors from Corpus Christi Theological Seminary. In 2007, Agapito’s hometown of Burgos, Tamaulipas, invited him to the celebration of 258 years of the founding of Burgos. Agapito put his musical talent back to work and easily composed the lyrics and music to the "Corrido de Burgos." Obviously, this was a great tribute to Burgos and its magnificent people. The mayor of Burgos paid homage to Agapito for the dedication and love he exhibited to his hometown of Burgos and its people, as well as his undying and unique musical talent. In February 2009, Burgos hosted another celebration. Due to prior commitments, Agapito was unable to attend. Julian Jose Zuniga Trevino authored a book entitled "Viva Burgos" that includes the life stories of many of its people that have contributed in some form or fashion to the beautiful town of Burgos–Agapito is one of them. He is honored by Julian's undertaking and salutes him for this endeavor. 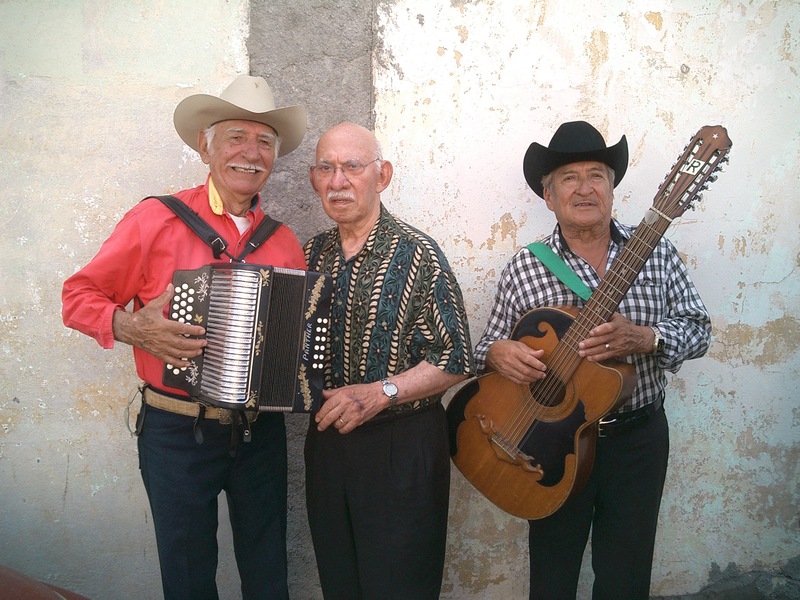 Pictured with Agapito are his younger brother (left), Adan Zuniga (also a long-time accordion player until his retirement) and a mutual friend. Agapito Zuniga entered into glory on January 16, 2015 at the age of 90. Agapito, a loving and compassionate husband and father, loved and served the Lord with vigor and enthusiasm. Agapito was married 63 years to the love of his life, Odilia. He is preceded in death by his son, Juan Jose Zuniga (1948-2011), and is survived by his loving children, Pete Zuniga, Homero Zuniga, Ludi Zuniga, Sylvia Zuniga-Vargas, and Rev. Arnold Zuniga, all of whom were extremely proud of their father; 15 grandchildren, and 24 great grandchildren. Agapito is missed by many. It is a blessing and a privilege to have Agapito Zuniga as our dad. He has been an inspiration to each one of us, and we simply say "Thank you, Dad" for your unconditional love and support throughout the years. Zuniga children from left to right: Homer, Sylvia, Juan (1948-2011), Ludi, and Pastor Arnold. Homer, Ludi, and Arnold reside in Corpus Christi, Texas; Sylvia resides in Houston, Texas. 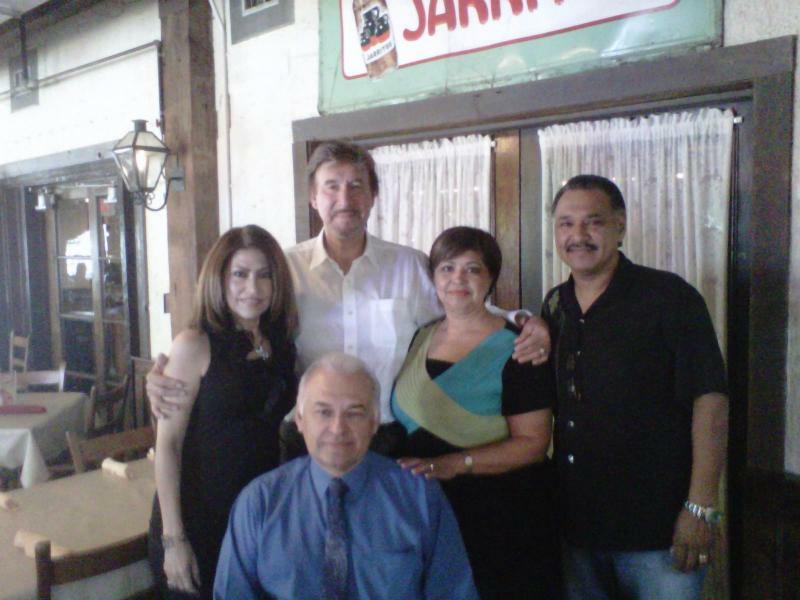 Zuniga siblings from left to right are Sylvia, Pete, Ludi, Arnold, and Homer. 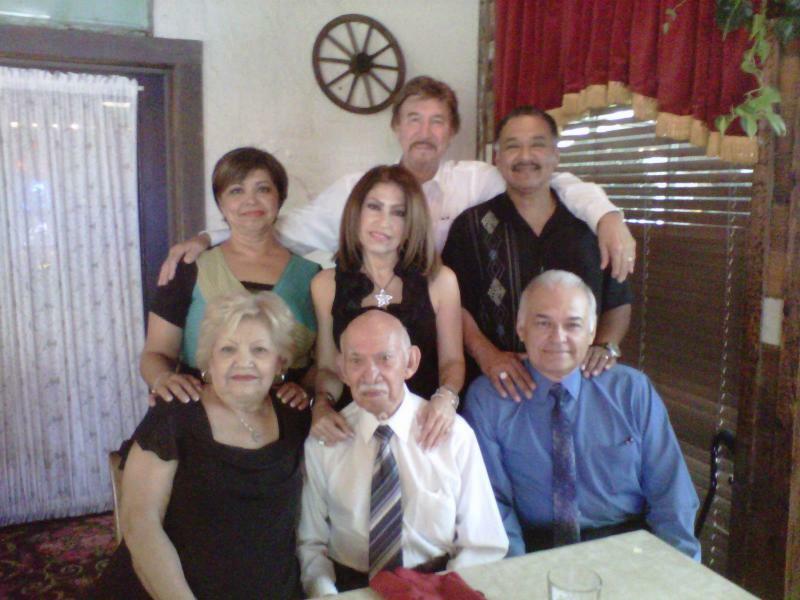 La Familia Zuniga: Ludi, Pete, Sylvia, Arnold, Odilia, Agapito, and Homer. Homer: It is with sincere pride and joy remembering the travels with dad as I was growing up. The tours to California, Arizona, Nevada, Chicago, Texas, and many other states, were very memorable. Being with my dad and my brothers was a great experience; meeting many fans and seeing old friends was fantastic! I will never forget the many memorable tours I experienced with him; they will remain in my heart forever. To my dad, I say "thank you" for the memories that will live in my heart forever. I will always love this man, my dad. . . Agapito Zuniga "El Escorpion." Sylvia: Honorable, dedicated, trustworthy, and loving--these are but a few words that represent my father's character. As a child, my father instilled in me the importance of moral and ethical values. The great thing about the life lessons I received daily from him is that he actually practiced what he preached to me! What a wonderful example he set for my siblings and I. I commend him for the work he accomplished in the secular sect, but more importantly, for his unyielding devotion to spreading the gospel, both in the United States and abroad. He was and continues to be a loving father with a heart of gold. I love you, daddy! Juan: At an early age, dad made it a point to involve me in music. I was a mere 13 or 14 years old and had begun studying music and playing the saxophone in school. After school, we would go out to the back yard where I'd practice playing "real" music. Dad saw my progress; that's when he decided it would be good for me to accompany him on tours so that I could observe and learn the art of playing the saxophone. It didn’t take long for dad to give me the opportunity I had been waiting for: to play in his group! What an honor--what a privilege to have played with one of the greatest accordion players–my father! To him I say this: Thank you for having the confidence in me and giving me a chance to prove myself, and thank you for being a great mentor, father, and friend–you have made me proud. I love you, dad. Ludi: In the many conversations daddy and I have had, I always said to him, “When I grow up, I want to be just like you." Daddy is a man of few words now; however, as I was growing up, he taught me so much. He’s a man of integrity, compassion, and love; he is courageous and has a very giving heart. Daddy cares so much about people and their well being. He has been, and still is, a wonderful example to me. I’m grateful to God for what He’s done in my father’s life, and I’m very proud of all of daddy's accomplishments. I love you, papi. Arnold: A conjunto music legend, record producer to some, and a music pioneer to others. As the youngest of the Zuniga children, I would have to agree that Agapito Zuniga is that and more! Giving over 50 years toward entertaining people throughout the United States and Mexico, he has invested in people's lives for over 25 years preaching the Good News of Jesus Christ as a credentialed minister of the Assemblies of God. Rev. Agapito Zuniga is not only a music legend, pioneer, producer, and Evangelist--he is my hero and my loving dad. Papá, te amo! 2016 © Agapito Zuniga. All rights reserved.